Undefeated professional boxer Albert Pagara of ALA Boxing Gym promised to successfully defend his title belt against Mexican Raul Hirales. 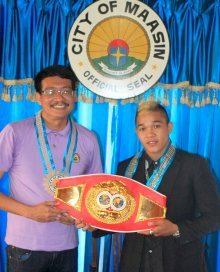 The Maasin City-born fighter is set to stake his International Boxing Federation Inter-Continental super bantamweight title during the Pinoy Pride 28 on November 15, 2014 at the Waterfront Hotel and Casino in Cebu City. “I want to please my countrymen and do all I can to win over the Mexican,” said the dreaded knockout artist. “I can’t predict what particular round, but I will strive to stop him.” Pagara has won all his 21 fights with 15 KOs. Prince Albert is fresh from his impressive first round stoppages of Mexican Hugo Partida and Indonesian Isack Junior in the earlier editions of Pinoy Pride. He wowed his hometown fans when he floored Indonesian Skak Max via 3rd round KO at the Maasin City. In the same venue he let Thai Tawanrung Eausampan kiss the canvas unable to recover for several minutes following a brutal 2nd round KO. Hirales is no pushover though and is considered as a “killer boxer.” He stopped fellow Mexican Francisco Leal in the 8th round and three days later Leal died of brain injury incurred during the fight. Hirales dominated that fight on October 19 last year and knocked Leal down in the sixth round with a clean right hand. Then, in the final minute of the eighth round, Hirales connected with another powerful right hand to the head, and Leal was knocked down again. He stood up to beat the referee’s count but collapsed to the canvas prompting the referee to stop the fight with 10 seconds remaining in the round. Leal, nicknamed “Little Soldier,” was taken from the ring on a stretcher and went to a coma in the hospital and later died. Pagara was not threatened of the “killer” tag of his Mexican opponent, the number one IBF intercontinental superbantamweight contender and the mandatory challenger. “I will grab every opportunity to stop him as early as possible,” added Pagara. Photo by Atty. Bombom Demeterio showing Albert Pagara with Mayor Maloney Samaco of Maasin City.